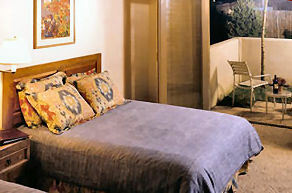 Welcome to the comfort and hospitality of the elegant Fechin Inn, an artistically elegant Taos Hotel. We offer the quintessential Taos New Mexico Lodging experience, ideally located within walking distance of historic Taos Plaza, galleries, shops and restaurants and set on a serene 6 acre park- like property. Built to reflect the style of the home of Russian artist, Nicholai Fechin, this 84-room hotel offers guests a taste of the southwest: smooth adobe walls, carved woodwork, open courtyards complete with chile ristras. The inviting, spacious Fechin Inn lobby is filled with light from the clerestory windows and French doors. This is where guests can savor a gourmet continental breakfast, served daily with that special Taos touch, and in the evenings socialize over cocktails in the breezes that grace the courtyard and hotel portal. Or enjoy the relaxing serenity in the library in an overstuffed chair by the wood-burning fireplace while enjoying the books, games or favorite T.V. show.